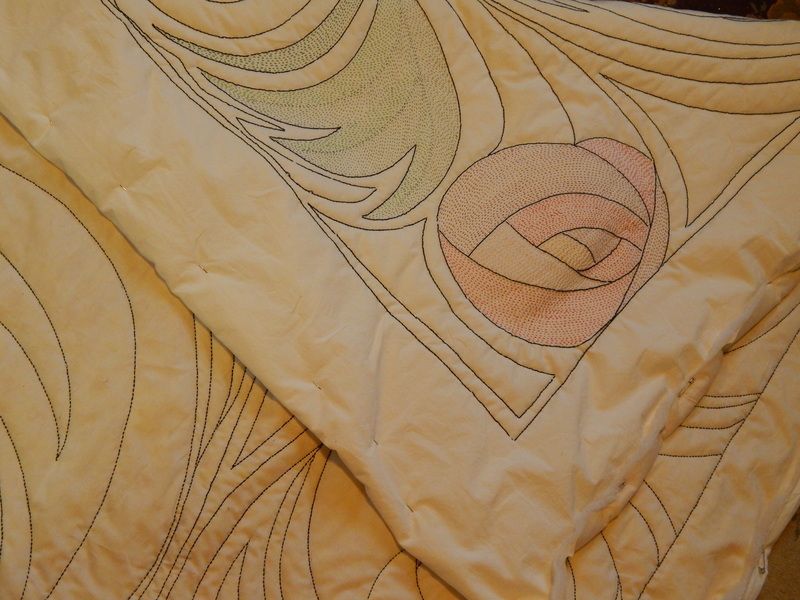 More hand quilting this weekend. I am using Presencia perle cotton in size 8 and 12. I have used about 20 different colors so far. 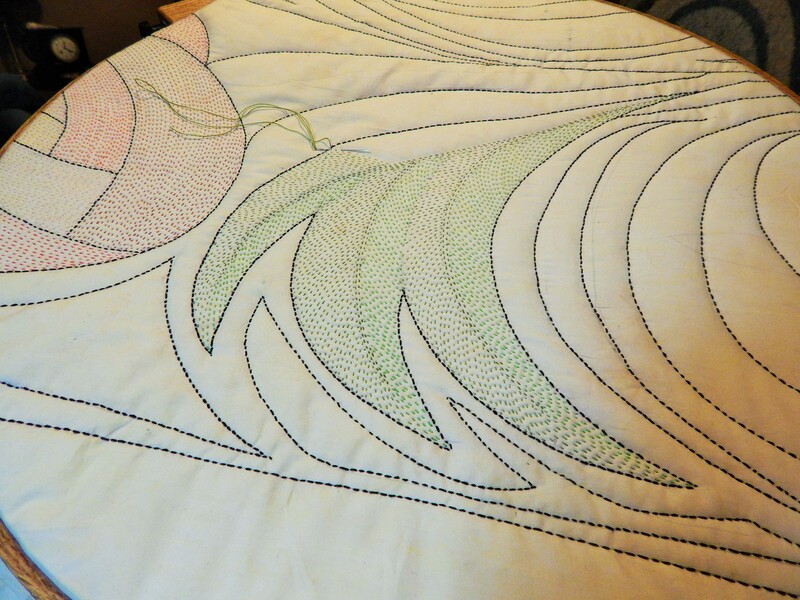 This entry was posted in Quilts and tagged hand quilting, Mackintosh Rose, presencia thread, whole cloth quilt. I love all your pictures, but the last one is my favorite. You and Teddy are lucky to have each other. Your quilting is lovely as always, Tim. Have you ordered more thread yet? Teddy looks very impressed, as am I. Beautiful. Oh this quilt is going to be awesome, Tim…. 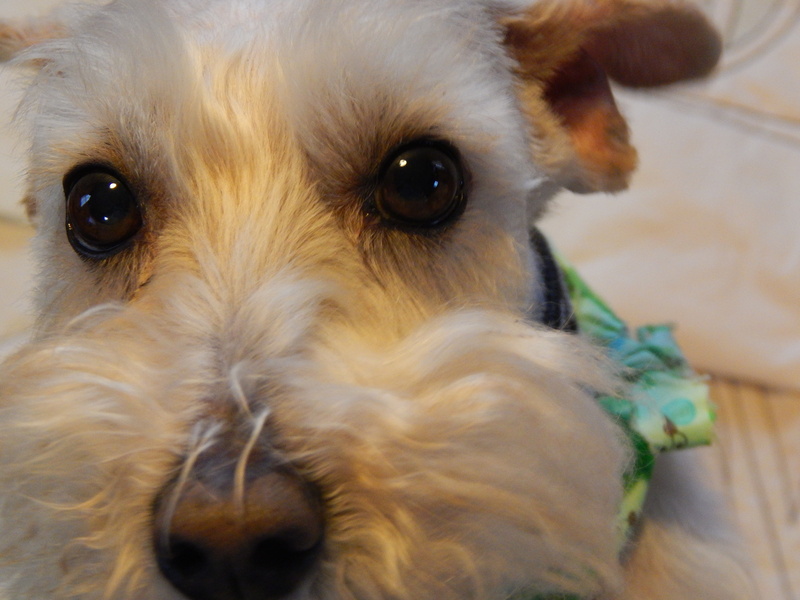 And I love the close up shot of Teddy! What a great companion he is! Was he doing some close-up inspecting? Looks like he takes his job as inspector very seriously! I like this technique–almost looks like painting with thread. This quilt is going to be stunning! I love the shading that is developing with the different colors and the texture is wonderful. What type of fabric are you using for the background? This really is a brilliant take on Charles Rennie Mackintosh – you work so fast! Tim, you have inspired me with this quilt. I just got my order from Presencia on Friday, and I can hardly wait to try it out. I got the sampler reds pack, and I can see it in conjunction with Union blue. Thank you again for the idea! Abbey sends her best to Teddy. Awesome quilting with colored thread. As always Teddy looking handsome as ever. Tim: What size hoop do you use? Your favorite batting? Thanx! Answered all my questions. Should have read here first!!!! Great blog! Look at Teddy!!! He’s so precious. The quilt is coming along very well. It will be beautiful when you’re finished. Happy quilting.